This is a sweet gem of a film. All I expected on my way into Hearts Beat Loud was to witness an average film but was instead rewarded with a hugely spirited and infectious music drama. 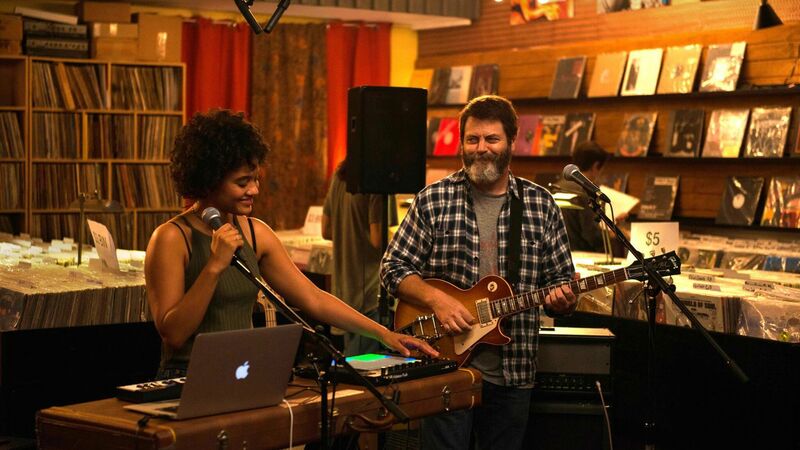 Frank Fisher (Nick Offerman) has been running his record shop for an impressive 17 years, but with money worries and his daughter Sam (Kiersey Clemons) heading off to college, Frank wants one last shot at a pipe dream of being in a popular band. He persuades Sam to lay down a track which could lead them to spend more quality time together. Obviously with a movie within this genre you’d expect the songs to stand up strong and the plot to perhaps just vaguely keep up in the background, but even though Brett Haley and Marc Basch’s screenplay is simple and is a very familiar narrative, it beats loud with a warmness and gladly there’s a gentle drip-feeding of humour to prevent the movie from going into complete sentimental overdrive. The developing connection between father and daughter is amusing, emotional and rich with an electric chemistry. The combination of story and music in Hearts Beat Loud works exceptionally well, in the fact it had me utterly invested in the relationships shown on screen. There’s a romantic thread throughout the story revolving around Sam and an arty individual, which is touching and becomes very nearly heartbreaking as you see Sam sing one of her own songs to the person she loves. The original songs throughout this film are beautifully written and I’d be disturbed if one or two weren’t up for one of those special gilded trophies in the New Year. There’s a marvellous feel-good quality bursting from this film, a feeling in a similar vein to how I react during my many watches of Sing Street. Seeing the Fishers perform their ditties are great, admittedly three of them are shown in a vinyl store make-shift gig but that simplicity works wonders and really has you focusing on the lyrics. The title track is excellent and the first time you hear Hearts Beat Loud come together is pure joy. The freshness of seeing a dad and his child constructing a catchy tune gave me goosebumps and throughout every song I was foot-tapping, head-bopping and stuck with a goofy smile. Nick Offerman is superb and excels as the wishful dad with a past coated in musical know-how. Watching him try to connect, make jokes and music along the way is great. Offerman clearly knows how to play the comedic side of things from Parks and Rec to his small but amusing appearance in We’re The Millers, but here he also brings to life a character facing a time of monumental change and he acts this frustrating sense of loss and unchangeable growing pain with a wonderful subtlety. Kiersey Clemons is amazing too: her vocals and talent are undeniably strong and she showcases the softer, emotionally charged side of the story with ease. Scientists have stated that music is a drug and Hearts Beat Loud truly proves that, with an addictive soundtrack and a set of performances that had me on a high. Hearts Beat Loud is out now in selected cinemas across the UK.